The grand master of French cuisine, Paul Bocuse, died on January 20th at the age of 91. He was an innovator, a talented creator, but above all the most beautiful ambassador in the World of Gastronomy. Mr. Paul, the greatest chef of the twentieth century, died at the very place where he was born and knew this great destiny, his “Auberge” in Collonges-au-Mont-d’Or, and where he maintained three Michelin stars for more than half a century. He influenced the entire world and, as there was a before Auguste Escoffier and an after, even more there was a before Paul Bocuse and an after. His influence has spread around the world. He was one of the pioneers of the “Nouvelle Cuisine”, long decried by some, but which was the royal way to take us where we are today. 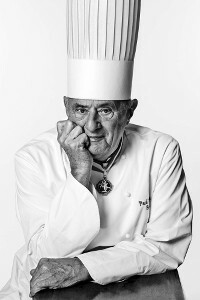 Paul Bocuse has elevated the status of Chefs, those behind the scenes, to that of renowned artists, coming out of the kitchen to meet the guests and appear in the dining room. His name is also synonymous with an international cooking competition, the one he designed and named after him, the Bocuse d’Or, which takes place every two years at the Sirha exhibition in Lyon. Testimonies of respect are innumerable and emanate from the greatest chefs of today, in unison.